If you’re a parent you no doubt place your children’s health as your highest priority, and nothing is more worrisome than watching your children play on outdoor equipment — especially if that equipment is a known safety hazard. It’s a strange tradeoff to make as a parent because you want your children outdoors in the fresh air — after all, rising rates in childhood obesity demand that children get more exercise or risk greater health problems in the future — but you also want them free from harm. Many outdoor play options for children come with a risk to reward element that needs to be considered. Sports are great for the bodies and minds of children, but come with risks of physical injury; jungle gyms are great for the young climber in your family, but is a natural villain in the falls and broken bones category of outdoor play equipment. 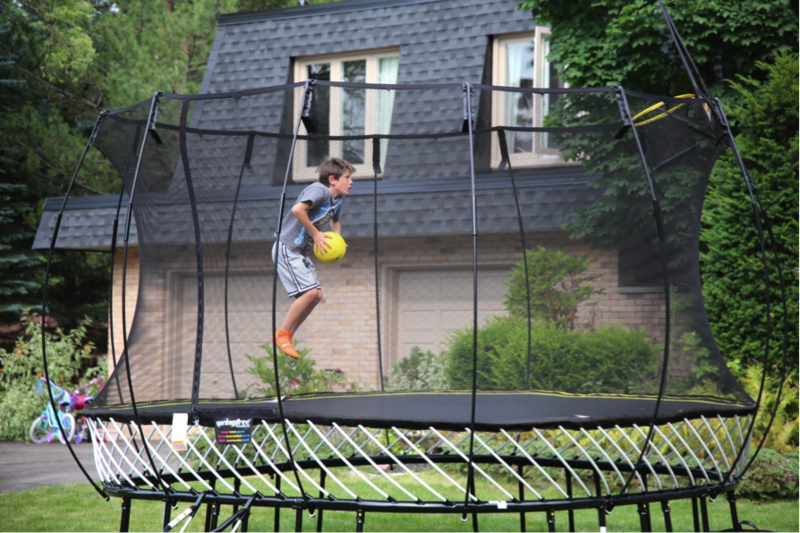 Many families are turning to backyard trampolines for their children’s play activity of choice — after all, trampolines offer hours of gymnastic fun with the added benefit of proximity, allowing parents to supervise their children’s playtime. In the fight against childhood obesity, trampolines are a great option — the only problem, however, is that parents can’t always be around to supervise their kids, and unsupervised trampoline play is a major cause of injury in Australia, and many doctors are calling for reform in trampoline safety standards. The problem is that the government is not taking many steps in this direction, and safety standards have hardly changed in the last 20 years. The good news is that one mechanical engineer and father has taken the initiative to change the trampoline industry himself. Australia’s Springfree Trampoline has redesigned the trampoline from the ground up, eliminating 90% of product-related injury through several major overhauls. Major additions include a SoftEdge™ Mat which is 30 times more shock absorbent than traditional pads, and a new FlexiNet™ enclosure, which cushions and protects bouncers thanks to composite support rods, ensuring strength without compromising protection. As traditional spring-based trampolines use rigid steel poles on their net enclosures, which increase the risk of contact-related injury. High tech flexible poles made from lighter but stronger materials to support trampoline netting coupled with a frame that is hidden beneath the jumping surface and away from bouncing children has reduced product-related injury by 90%. In addition, Springfree rigorously tests its components during the manufacturing process which guarantees that parts that will not degrade or deteriorate over time. Traditional trampoline parts will degrade within weeks of being exposed to Australian backyard elements, but a Springfree trampoline can stay outside all year long without the risk of component degradation. The specially-designed rods and fabric will not deteriorate over time and can withstand thousands of hours of harsh sun exposure. A composite rod trampoline offers better protection for your children, while offering a manufacturer’s guarantee of product quality assurance. If you plan on buying a trampoline for your family, why not trust the design of a doctor and a parent, a man who sits on trampoline safety boards in Australia, the UK, and other parts of Europe, and has dedicated his life and his business to providing families with the world’s safest trampoline? Hop online and discover Springfree Trampoline Australia for yourself. From there you’ll find a model that’s right for your family — and that prioritizes their safety first.